Other points of interest In the wreck it is very narrow and due to other divers visibility can go to zero. Do not enter if you have claustrophobic problems. The Miniya was originally a Russian class T-43 mine sweeper. Between 1956 and 1962 five of this type were build and sold to Egypt. A Minesweepers task is as the name is stating; Sweeping mines. To actually do this these boots were equipped with a floating minesweeper cable. That cable in a loop pulled by two minesweepers, while a strong current was sent through the cable. That created a strong magnetic field. That field tricked magnetic mines, adjusted to large ships, into thinking a large ship was passing and triggered them to explode. On 6 February 1970 four Israeli jets approached Hurgharda, probably Phantom F-4. The flew low to avoid detection by radar. Their target was the radar installation next to the airport. 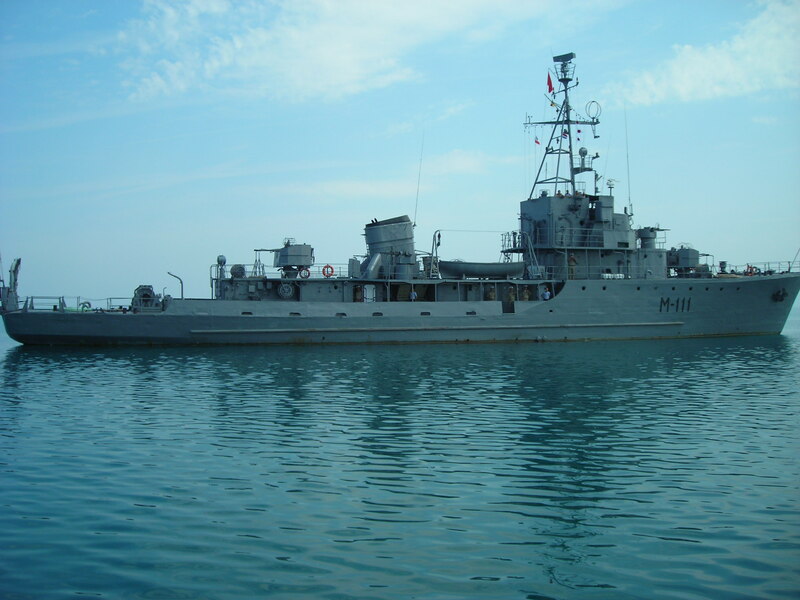 At that time the Miniya was anchored just outside the port of Hurgharda. On that spot she was a danger for the low flying jets so order was given to sank the Miniya. 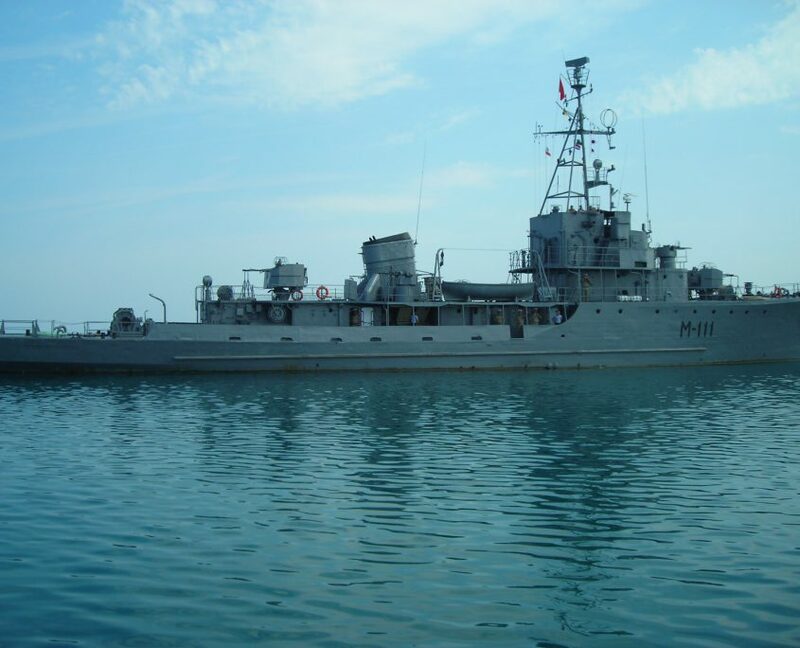 Two rockets were fired and hit the Miniya at the bow starboard side and sank her. 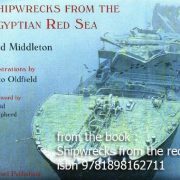 The wreck of the Miniya is just outside the harbor of Hurgharda. Also close by is the wreck of the Excalibur, a charter yacht. During that time the complete area was called El Mina, a mix-up of El Miniya en the Arabic word for Harbor, which sounds like El Mina. The Miniya is just outside the harbor of Hurgharda is confined water. So basically, you can always dive the Miniya, also with harsh wind. There is hardly any current. The depth is around the 30 meters, Normally you descent on a line tight to the propeller. The wreck in on its port side. So, if you reach the wreck, continue your dive at the left bottom to look at the ship. Near to the stern you find inside a door a large drum with the floating cable mentioned above. Do not touch the inside, that is pretty sticky stuff, also after all these years. Often this cable is confused with oil hose or something like that. Some goes for the floaters next to the wreck (pavanes) often confused with torpedoes. More upfront you find the bridge and a bit further the front deck with the hole the rockets made at starboard side. This is a perfect place to enter the ship. A small corridor in the middle goes along the ship to the stern and the engines. Please be aware that most of the time more divers penetrate the wreck and there is not a lot of space to pass someone. Also, be aware that due to divers the visibility van be nearly zero. So if you are a bit claustrophobic, do not enter the wreck. At the end of the small corridor you can find the two engines. When you have seen enough of this wreck and have enough air and dive time, you can swim from the stern, with a angle of about 45o to the right, to a small fishing boat of around 20 meters. This is about 40 meters away and worth visiting. This dive is, Due to its depth, not suitable for a check dive but nice as a last dive of a nice ‘Get Wrecked’ trip. Glasvisjes en wat ander klein spul.